He is a new parent to the school and frankly not my type of person. 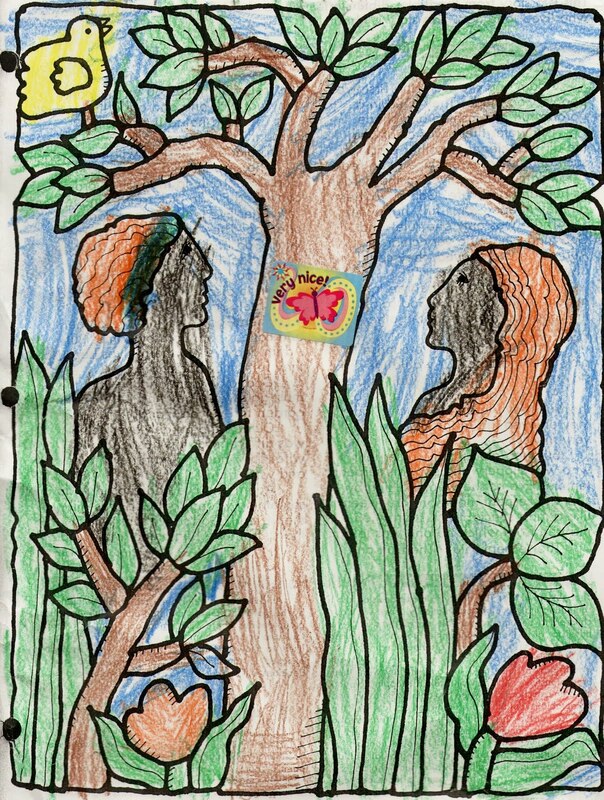 He looked at the picture, said in a slightly hushed voice to me, "Adam and Eve were black?" He grimaced a bit like it was something a bit odd, glanced at my daughters kindergarten teacher and walked away. His tone and expression told me he thought one of the following: "What are they teaching kids here?! ", "Adam and Eve were white, not black! ", or "Your daughter is weird". I waited until we got home. My two daughters had overheard him and seen his expression and I did not want some random person having more influence over my daughters view of life than I do. I opened the folder at home and beamed at all her work. Everything had a smile stamp or this "very Nice!" sticker on it and was done perfectly. I complimented her on each piece and she smiled proudly. I held this art in my hands last. I asked her, "Sweetie, I love the way you colored in the lines and used your crayons to really make this picture look realistic. Can I ask you a question?" 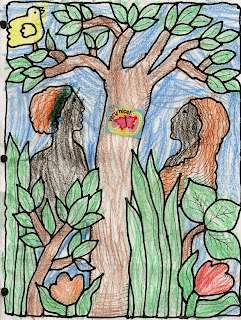 "Why did you color in Adam and Ewa (Eve in Polish) black? It's not wrong, I'm just curious." She glanced at it, shrugged and said, "That's the skin color crayon that I found." I nodded and said, "And you coloring in their skin color as black is perfectly fine because...." and I trailed off so that she could finish the thought in her words. She looked at me with a smile, "Because some people are black!" I hugged her. I told her, "That's right. Some people are black, some people are red, yellow, white. We are all different, aren't we?" She nodded and told me about a song they were learning in school that celebrated this and talked about different skin colors. Jesus Loves the Little Children*. I had another thought. She may be in Catholic school and I may want her to find comfort in believing in God if she chooses to, but I wasn't going to take history, fact, and genetics and human evolution and science away from her or her sister. "You know, nobody from the time of Adam and Ewa is still alive. We have no idea what color they were." "So, they could have been black?" my daughter asked. I nodded, "They could have been any color for all we know." She started playing with the Smurf doll her little sister handed her. I patted her back, hung this on the refrigerator, and told her, "This is your artwork, you can make it any way you want to." Because it is her art work. Not that man's. She sees that the world is full of different people and that none of us is better than another based on appearance. I want her to know that. To be honest with you the 1st thing I noticed about the picture is how well she colored and stayed in the lines. I didn't even notice the black until I read further. Once a teacher told my daughter is was wrong to color people's faces purple, it was her favorite color. Way to squash a child's creativity! And it is very likely that Adam and Eve had darker skin, being from where we believe they are from. They really spoke to me when I took a child development class in high school. When I first looked at the picture I didn't see any issue. In fact, I had to read the post to find out why it was so special. The artist in me sees great use of color and she stayed in the lines really well. Nothing more or less. That dad needs to shove it. He has been looking at too many European depictions of bibical people. It is highly unlikely they were white due to geographics. What on earth is wrong with some people on this planet?! What does it matter if they were coloured black, pink, orange or even green? I would have been so mad at the Dad for even mentioning the subject of whether Adam and Eve were black or not - it makes no difference!! I think your daughter's picture shows a wonderful understanding of our world in that, yes we are all different - but that's what makes it such a wonderful world to live in. Please tell her I think her picture is awesome!! This is wonderful! Lovely picture and a lovely story. Children are not born bigoted. It's something learned, and, sadly, that man will probably pass it on to his kids. But hopefully they will know better. Give that cute little daughter of yours a big hug!